I didn't have a chance to write about the games, but wanted to quickly talk about the two Thursday night games. In the first game, Northern Arizona held off Sacramento State in an entertaining contest, with a final of 73-64. It was an interesting battle of contrasting styles, as NAU has no real post game, while Sac State tried to pound it down low. 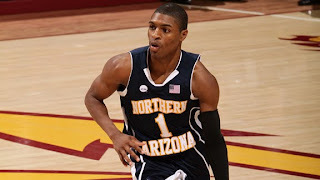 For NAU, the star was freshman guard James Douglas, who had 22 points, including 4 treys. He seems to benefit from the addition of Gabe Rogers, who is a guy that defenses must account for at all times. Rogers had an inefficient 17 points (5/16 shooting), but you can bet he is a big help to the offense just by his presence out there. Stallon Saldivar had 2 points and 5 assists, but it is apparent to me that he is clearly the best passer in the Big Sky. I know Dylan Garrity is leading the conference in assists, but I would take Saldivar over him at this point. Finally, even though he is 6'4'', Durrell Norman is the de facto big man for NAU a lot of the time, and I love watching him play. He is a definite scrapper, finishing with 15 points and 9 boards. He uses his body well. For the Hornets, they might have been undone by their FT shooting, where they were an abysmal 8/21 from the stripe. Konnor Veteto had a nice 17 and 8 game, but was just 1/6 from the line. With a little better shooting, this would have been a different game. It is a tough road loss for the Hornets in a game that was very tight throughout the second half, but in the end they are in the familiar position of being on the wrong side of .500. In the other game, I expected Weber State to blow out Idaho State, and it kind of played out that way. The game was never really in doubt, with a 78-64 final, but ISU kept it competitive thanks to the great game by Chase Grabau. Grabau was 9/13 from the field and 10/11 from the line, scoring a career-high 31 points to go with 7 rebounds. He has been their best all-around player this year, but this was certainly the best performance we have seen from him. He single-handedly kept them close, and hopefully they can build on that. For Weber State, there were two stars. One was Damian Lillard, who was right at about his average, scoring 26 points in this game to go along with 3 assists. As usual, it was a very efficient night, as he was 8/13 from the field and 8/8 from the line. He makes great decisions and runs the offense very well. The big key for them was Scott Bamforth's play. He has been struggling a little bit at different times this year, but he got open and knocked down some shots, scoring 21 points. If he can become a reliable #2 scorer, Weber State is the best team in the Big Sky. For Weber State and Northern Arizosna, 1-0 is a beautiful thing.